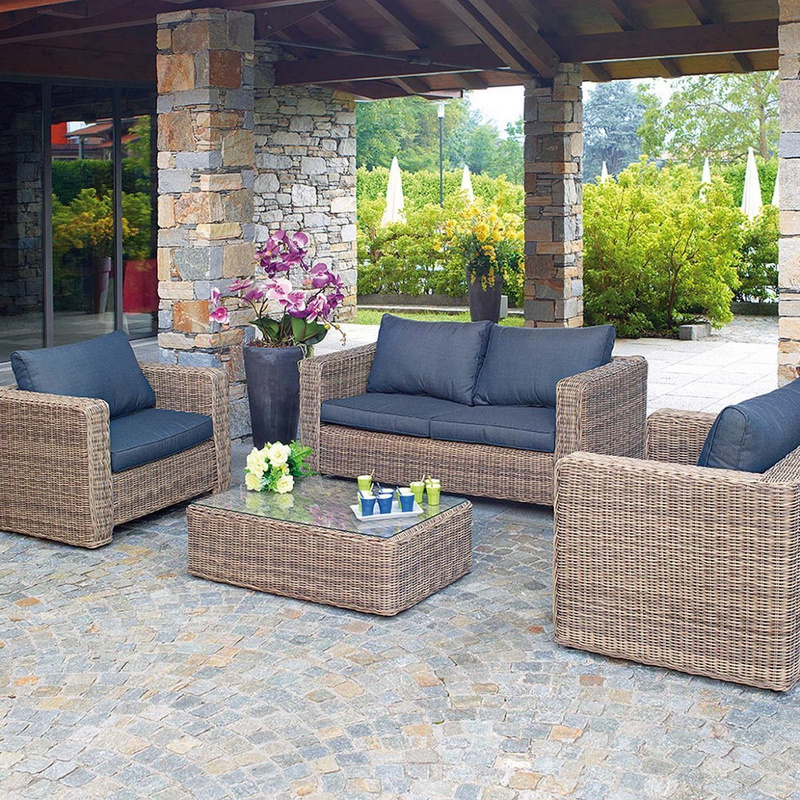 Trinidad garden lounge, to furnish your outdoor space with a set featuring a convenient and impeccable style. The Trinidad garden lounge signed by Greenwood presents a very sophisticated and strong visual impact, while being defined by a sober and elegant design. The set is composed of 4 pieces: a comfortable 2-seat sofa, a coffee table and two large armchairs. 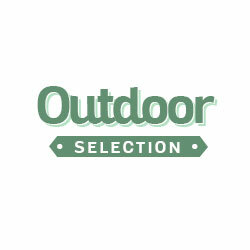 This lounge furnishes every type of outdoors, from the garden to the terrace, from the poolside to the backyard, adding comfort and beauty to your home. Cozy and warm air, the Trinidad garden lounge invites to relaxation and conviviality. 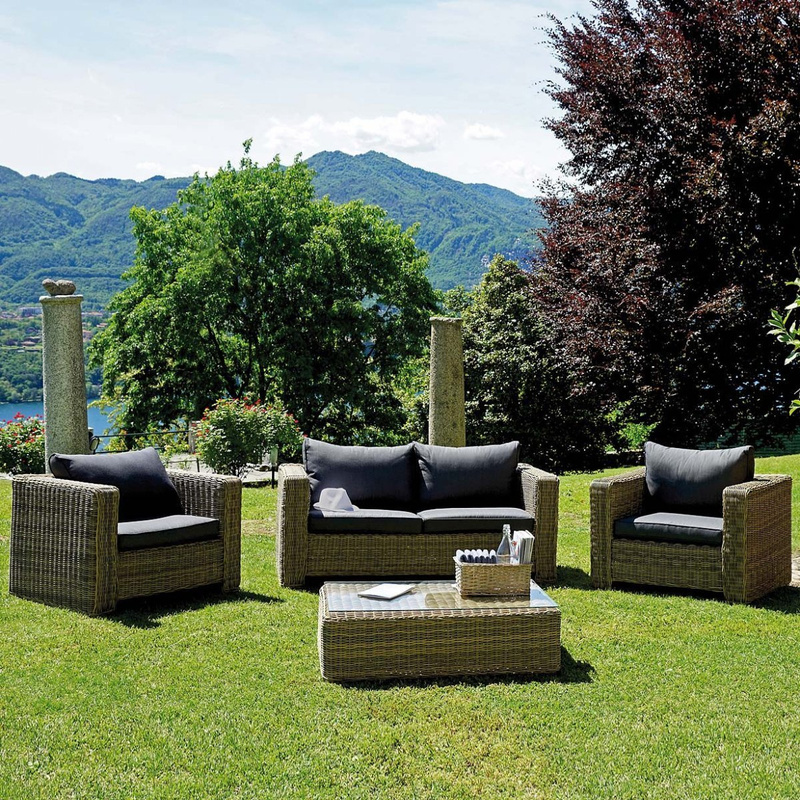 The material of which the sofa, the coffee table and the armchairs are made is the synthetic grey kubu wicker, with thin twine (Ø: 5 mm) that, thanks to a wise processing, takes on an appearance very similar to natural fiber. This synthetic variant ensures high protection from weather and wear and contrasts the absorption of moisture or water in case of rain. This material, timeless, pleasant to the touch and particularly robust, is proposed here in an attractive light colour that gives a touch of freshness and a very modern style to this garden lounge. The coffee table, with a low and rectangular shape (sizes: H 30 cm/W 100 cm/D 61 cm), is covered by a sheet of glass that adds elegance and supports perfectly soft drinks, coffee cups, books and magazines, remaining also extremely easy to clean. The sofa and the armchairs of the Trinidad garden lounge have generous dimensions: the seats are spacious and comfortable, as well as the armrests that, without interruption, entirely wrap the backrest. What makes both the sofa and the two armchairs irresistible are the large and soft cushions that cover both the seat and the backrest. Rectangular and with profiles defined by definite seams, they are removable to be easily washed and are characterized by a dark grey colour, a shade that creates a charismatic contrast with the light shades of the structures of the furniture. 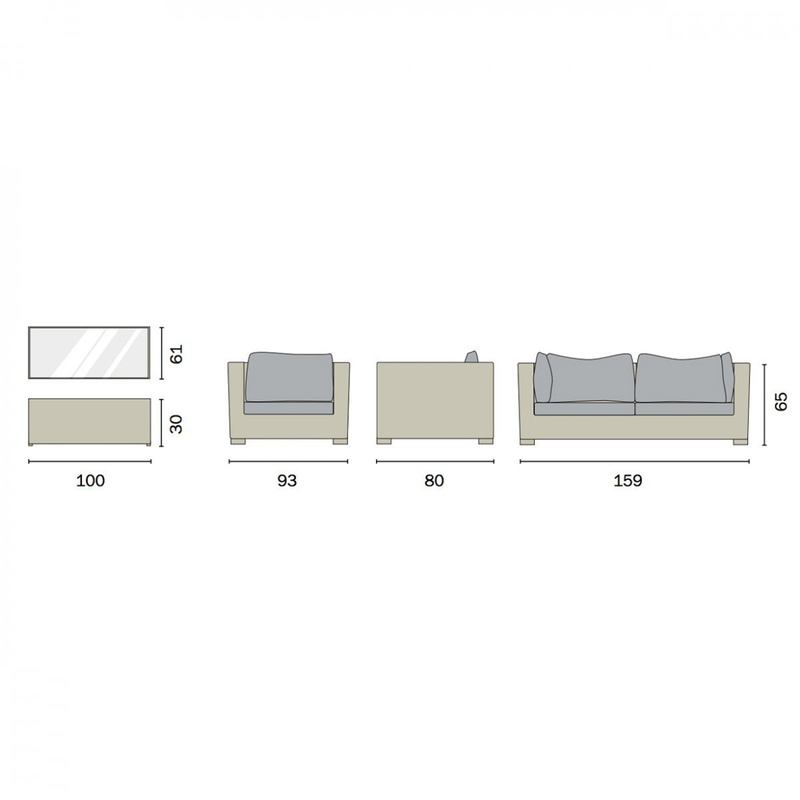 Information: the chairs have sizes H 65 cm/W 93 cm/D 80 cm; the sofa has sizes H 65 cm/W 159 cm/D 80 cm. It is recommended to gentle wash in cold water.